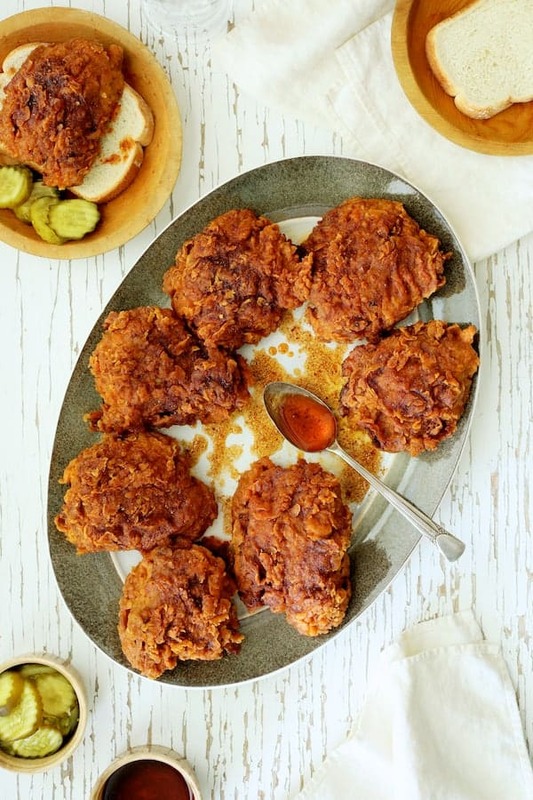 Nashville Style Hot Fried Chicken is famous for its spiciness! One bite and you’ll be hooked! 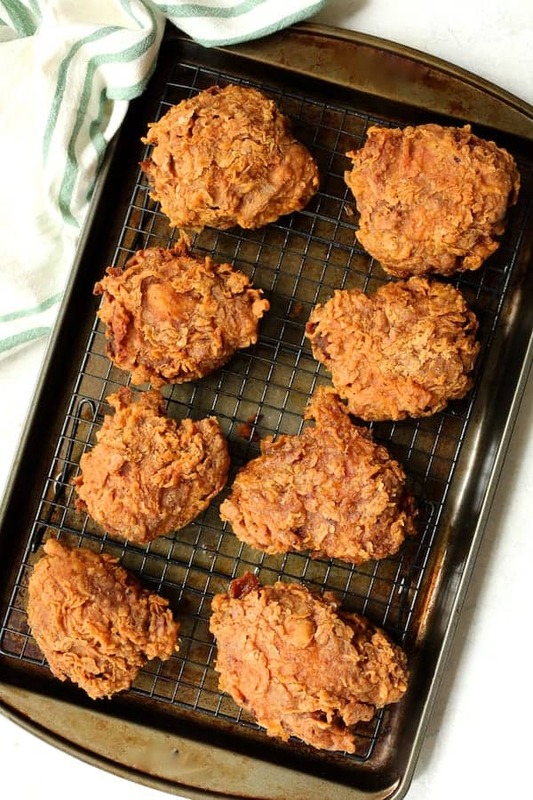 It will become your favorite fried chicken indulgence for dinner or your next picnic! Happy Memorial Day Weekend everyone! Hope you enjoy a wonderful extended weekend with your family and friends and pause to remember those who made the ultimate sacrifice for our freedom! I get teary thinking about the selflessness and bravery so I’m going to move right on! 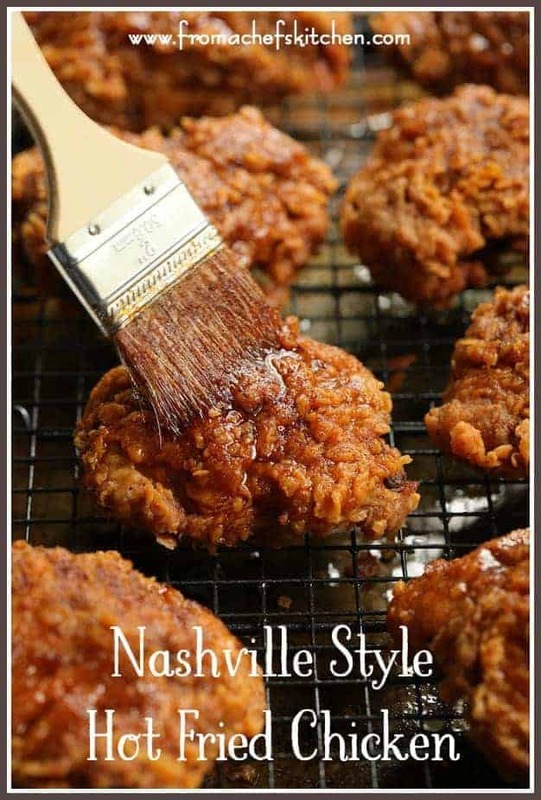 Nashville Style Hot Fried Chicken! Oh, baby! 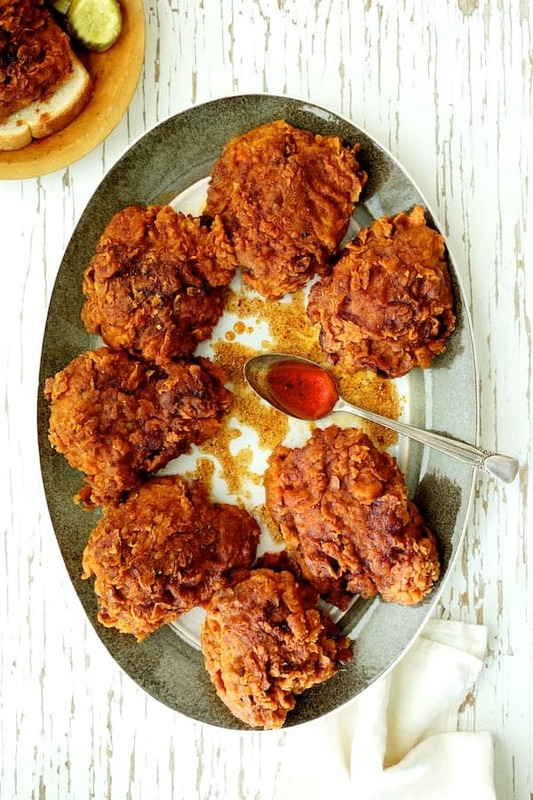 Living in the South, fried chicken is a part of everyday life! If you’re ever in Memphis, you must try Gus’s World Famous Fried Chicken! Because I live in Tennessee, Nashville Style Hot Fried Chicken is also something I hear a lot about. Last summer we traveled to Nashville for the big eclipse. On my list was to visit Hattie B’s for her famous hot fried chicken. Everyone else had the same idea and the line was at least 100-people long just to get in the door! In the 95-degree heat, it was out of the question. We ended up going to a different chicken place I’d rather not mention and forget about. Then, I heard Hattie B’s opened a place in Memphis. Yessss!! Finally an opportunity to try this iconic fried chicken! That too may not happen any time soon because the parking situation is horrific and the lines are crazy long. 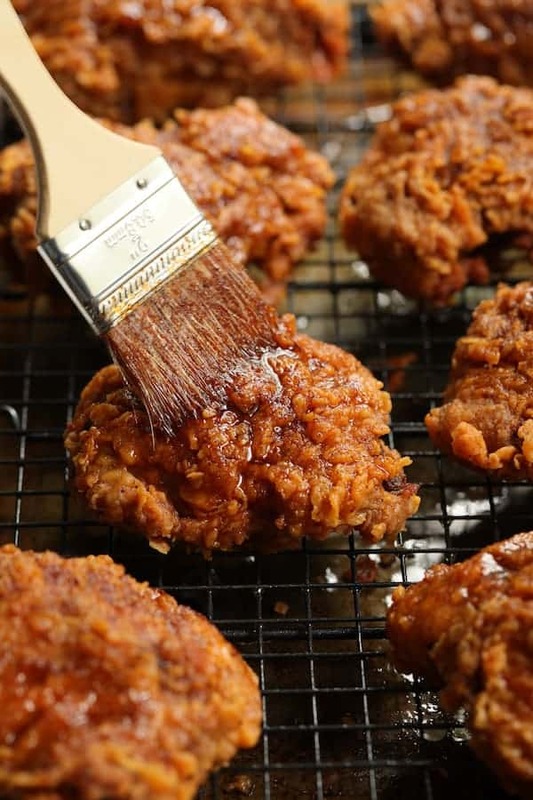 What’s a spicy food–fried chicken lover to do? Make their own! 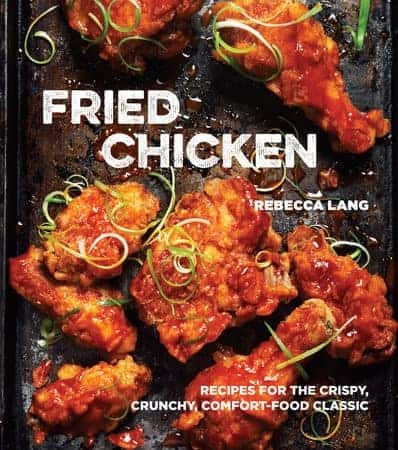 A while back, I reviewed Rebecca Lang’s Fried Chicken cookbook (Affiliate Link) so pulled it out when I was ready to make my Nashville Style Hot Fried Chicken. You can read my review HERE. Now, I have to tell you that my attempts at making fried chicken in the past have been less than stellar. In fact, I’ve had some fried chicken bombs. It either wasn’t done or got too done and tasted burned. I’m happy to report this chicken turned out amazingly good! Crispy. Spicy. Tender. Lovely! 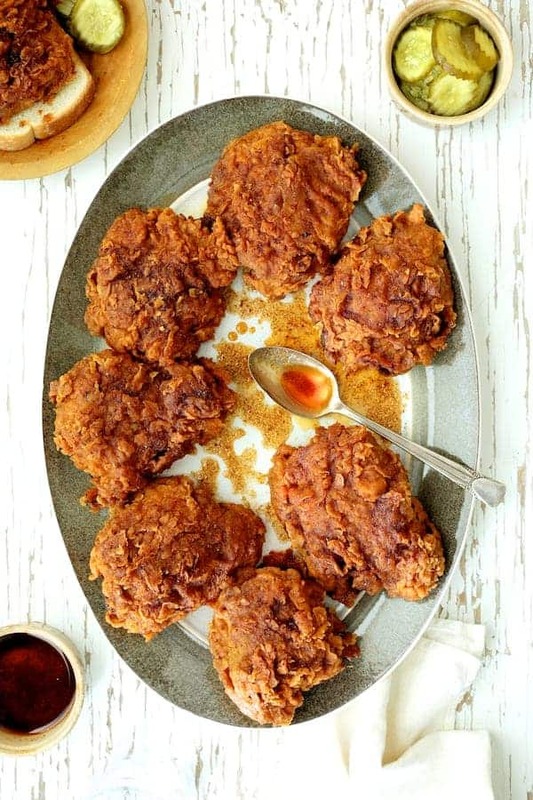 Paying homage to Hattie B, I wouldn’t dream of comparing anything to hers, so I’m calling it Nashville Style Hot Fried Chicken. 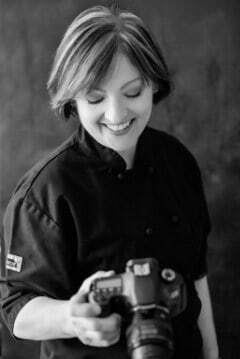 Rebecca Lang refers to it as Tennessee Hot Chicken in the cookbook because I’m sure nothing compares to the original. I followed the recipe in the book, but I really tried to simplify it for you. If you’re unsure about the level of heat, just back off the spices and hot sauce. You can always drizzle some extra hot sauce over it or serve it on the side. Mix up the marinade ingredients and marinate the chicken for at least 12 hours or overnight. Remove it from the marinade and wipe off some of the excess marinade. Batter up! You’ll need three bowls: Two for flour and spice combinations and one for the spicy buttermilk and hot sauce combination. Then fry, fry, fry! I don’t have photos of the chicken frying because it’s really not that pretty and hot oil is something you never, ever want to take your eye off of. Keep the temperature at about 335 degrees and you should be safe. I used a deep fryer to easily maintain the temperature. Drain on a rack and that’s it! 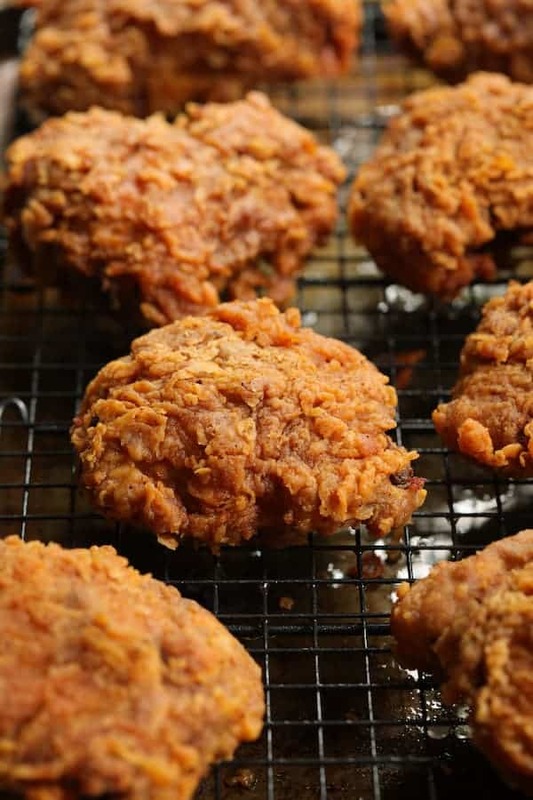 If you need to fry in batches, preheat an oven to 175 degrees to hold the chicken warm. Mix up the sweet-spicy hot sauce to brush over the top. And enjoy with white bread and pickles! 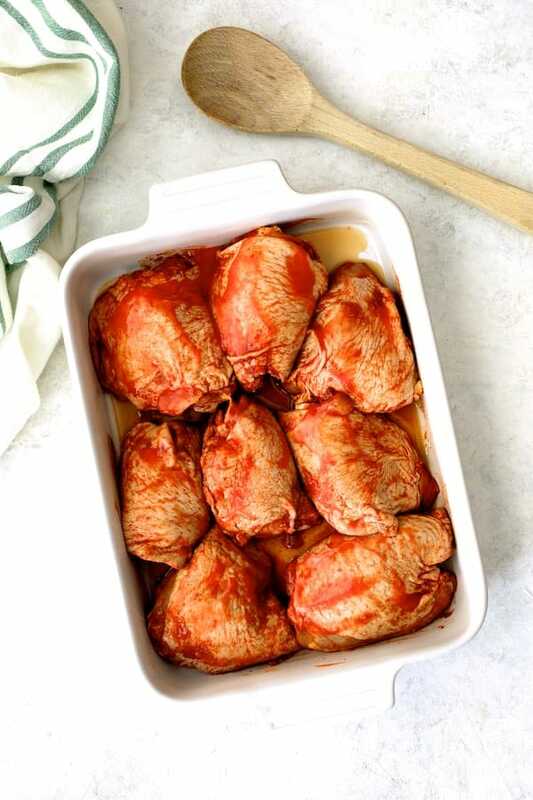 MARINADE AND CHICKEN: Whisk marinade ingredients together in a small bowl. Place the chicken in a zipper-top bag and pour the marinade over the chicken. Seal the bag and rub to coat the chicken. (Double bag if the marinade aroma is strong.) Refrigerate 12 hours or overnight. BATTER: You'll need three bowls. In one bowl, combine 1 1/2 cups flour, 2 tablespoons cayenne pepper and 2 teaspoons salt. In the second bowl, combine remaining 4 cups flour, 2 tablespoons cayenne pepper, 2 teaspoons salt, paprika and garlic powder. In the third bowl, whisk together buttermilk and hot sauce. FRY: Remove the chicken from the marinade and pat with paper towels to remove excess marinade. Discard the marinade. In a deep fryer or large, deep cast iron pot, heat at least 3 inches of vegetable oil to 335 degrees. Set a wire rack over a rimmed baking sheet. Depending on the size of your deep fryer or pot, you may need to fry in batches. If so, preheat oven to 175 degrees. 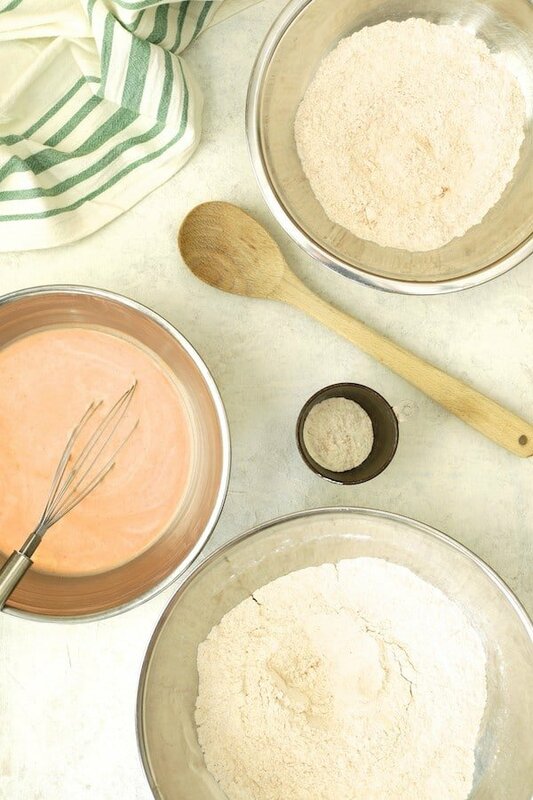 Dredge each thigh in the first flour combination, then dip in the buttermilk mixture, then into the second flour combination. Carefully and slowly, place the chicken pieces in the hot oil. (You want to immerse the chicken slowly so it does not stick to anything.) Fry for 16 to 18 minutes or until deep golden brown and a thermometer inserted into the center registers 165 to 170 degrees. Place chicken on the wire rack and place in the oven to keep warm if working in batches. HOT SAUCE: Whisk together brown sugar, cayenne pepper, smoked paprika and chipotle chile powder in a heat-proof bowl. When chicken is cooked through, turn the heat off the oil and allow any particles to settle to the bottom for a few minutes. Then ladle out 3/4 cup of the frying oil in the small heatproof bowl with the spices and whisk together. Immediately before serving, brush each piece with the sauce. Stir to keep the spices from falling to the bottom of the bowl. Serve on white bread with dill pickle slices. Made this chicken to bring to Super Bowl Party. Biggest hit of the party. Will def make again. When I made marinade for chicken I prepped flour batter etc. Made frying and finishing so much easier as the only step was to batter and fry no measuring etc. Hi, Mary, Thanks so much! Glad something was the hit of that Super Bowl! Ha! So glad everyone enjoyed and I love your tip to get everything prepped all at once. Thanks again and please stay in touch! This recipe is exactly what I think my husband would love for Father’s Day. So, so good. Thanks, Erin! I think he probably would! Hope you enjoy and an early Happy Father’s Day to your hubby! Ever since I saw your Facebook post I have not thought of anything else but how delicious that fried chicken looked and how I wish I had a piece. Oh, my goodness, how I would love a piece of your spicy fried chicken! Hi, Sharon, Thanks so much! It’s really worth the effort! So glad I quit waiting to try it and finally just made it myself! Thanks, Tamara! I rarely eat deep-fried foods, too. However, once in a while you just have to indulge and live a little! Good fried chicken is just one of those things!